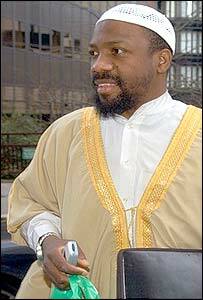 A Muslim cleric who urged followers to kill non-believers, Americans, Hindus and Jews has been jailed for nine years. Jamaican-born Sheik Abdullah el-Faisal, 39, was told he had "fanned the flames of hostility", as Old Bailey judge Peter Beaumont delivered the sentence. The judge recommended that el-Faisal, from Stratford in east London, should serve at least half of the sentence and then be deported. El-Faisal - who said it is permissible to use chemical weapons to kill unbelievers - stretched out an arm to a group of around 12 shocked-looking supporters as he was led away. Outside court, defence lawyer Jerome Lynch QC said there were plans to appeal, adding: "There is a realistic prospect that many Muslims will regard this sentence as harsh, even though they don't share his views." El-Faisal received seven years for soliciting murder, 12 months to run concurrently for using threatening and insulting words and a further two years - to run consecutively - for using threatening and insulting recordings. The Muslim cleric - the first to face trial in the UK - was charged after a tape of a lecture he gave was found in a car and others uncovered by police investigating al-Qaeda links in the UK. During the trial el-Faisal argued that his words were taken from the Koran, the Muslim holy book, and that he had been misrepresented. But the judge said that while Britain prided itself on its freedom of speech, it could not accept it when other people's rights were breached. He told el-Faisal: "As the jury found, you not only preached hate, but the words you uttered in those meetings were recorded to reach a wider audience. "You urged those who listened and watched to kill those who did not share your faith." One tape of el-Faisal, titled Jihad, contained the words: "So you go to India and if you see a Hindu walking down the road you are allowed to kill him and take his money, is that clear?" In a tape called Rules of Jihad, which is thought to have been made before the 11 September 2001 attacks, el-Faisal told his audience: "You have to learn how to shoot. "You have to learn how to fly planes, drive tanks and you have to learn how to load your guns and to use missiles." He said: "You are only allowed to use nuclear weapons in that country which is 100% unbelievers." The jury heard that el-Faisal tried to recruit British schoolboys for terrorist training camps and promised them "seventy-two virgins in paradise", if they died fighting a holy war. On a tape called Them Versus Us he said: "There are two religions in the world today - the right one and the wrong one. Islam versus the rest of the world." Defence lawyer Jerome Lynch QC, said it was unfair that people such as controversial cleric Abu Hamza al-Masri had been seen by police and not brought to court like el-Faisal. Abu Hamza - who was dropped as a defence witness after a police raid on Finsbury Park mosque - told the judge in a pre-trial hearing that he had been seen seven times by Special Branch. Mr Lynch said of el-Faisal: "This was a man who, although misguided, was not malicious." He said el-Faisal had helped young people, including drug addicts, in inner cities. But David Perry, prosecuting, said the el-Faisal was a "fanatic and extremist" who had tried to save himself by claiming the Koran was on trial. Deputy Assistant Commissioner Peter Clarke from Scotland Yard's Anti Terrorist Branch said: "El-Faisal's speeches were designed to do more than stir up racial hatred. He was actively urging young people to commit murder. "These are extremely serious offences, made even more appalling by his attempt to justify them through the Islamic faith." "The judge said he'd blatantly set out to stir racial hatred"